Hong Kong is a former British colony that, since July 1, 1997, is a special administrative region (S.A.R.) of China. Consisting of territories along the South China Sea as well as Hong Kong Island, the territory is a global economic hub and one of the most densely populated areas of the world. Hong Kong has a rich numismatic history ever since its early days as a British colony, and to this day its monetary policy is separate from China’s (as is that of neighboring Macau, another S.A.R. of China and a former Portuguese colony). Follow us in this article at we take a look at some of the numismatic history of this fascinating place, and some numismatic locations you can visit when in Hong Kong. While the region that now makes up Hong Kong has seen humans for many thousands of years, we start our story in 1842, when Hong Kong became a British Crown colony following the First Opium War. Initially, the British territory consisted of Hong Kong Island only, but by the 20th century the colony had expanded to encompass a small part of the Chinese mainland as well as many of the outlying islands, following the signing of a 99-year lease in 1898. This lease would eventually result in the handing over of Hong Kong from Great Britain to China in 1997. Coins were first struck specifically for Hong Kong in 1863. (Prior to that, various foreign coins circulated, although the British government tried—unsuccessfully—to introduce the pound sterling to the colony). Initially all but the smallest (1 mil) denominations featured the portrait of the reigning British monarch. After the Chinese takeover in 1997 the designs were altered to conform to a more Chinese standard, but to this day you will occasionally get a coin with a portrait of Queen Elizabeth II in circulation. At present, 10-cent, 20-cent, 50-cent, 1-dollar, 2-dollar, 5-dollar, and 10-dollar coins are used, issued by the Hong Kong Monetary Authority on behalf of the Hong Kong government. The design incorporates a bauhinia or Hong Kong orchid tree on the obverse. The coins are minted quite infrequently and, generally, speaking the current supply tends to be sufficient for quite a few years (some of the lower denominations have not been minted since the 1990s). For first-time visitors (and numismatists), the banknote situation in Hong Kong can be a little bit confusing. Starting in the 1860s private banks issued banknotes denominated in Hong Kong Dollarsd. Some of these banks merely had offices in Hong Kong and issued banknotes there with a common design also seen elsewhere. This resulted in a wide variety of different issues from many different banks, such as the National Bank of China, the Mercantile Bank of India, the Oriental Bank Corporation, and the Asiatic Banking Corporation. Generally speaking, most of these notes are extremely rare, and many are known only from specimens or proofs. Starting in the 1930s the government of Hong Kong issued a small number of lower denominations that circulated along with the issues of the private banks—a situation that continues to this day. At present, a polymer 10-dollar note is issued by the government of Hong Kong, while banknotes in five other denominations (20, 50, 100, 500, and 1,000 dollars) are issued by three private banks: the Hongkong and Shanghai Banking Corporation (HSBC), the Standard Chartered Bank, and the Bank of China. The notes share identical colors between the three banks, but the designs are noticeably different. Now, let’s presume you find yourself in Hong Kong and you wish to do a numismatic tour of the city. With the city ever evolving and modernizing, very few older buildings remain, and when it comes to the financial institutions no classic buildings (as pictured on some of the earlier notes) remain. Still, there are a few stops a coin or banknote collector can make, beginning with the three note-issuing banks. 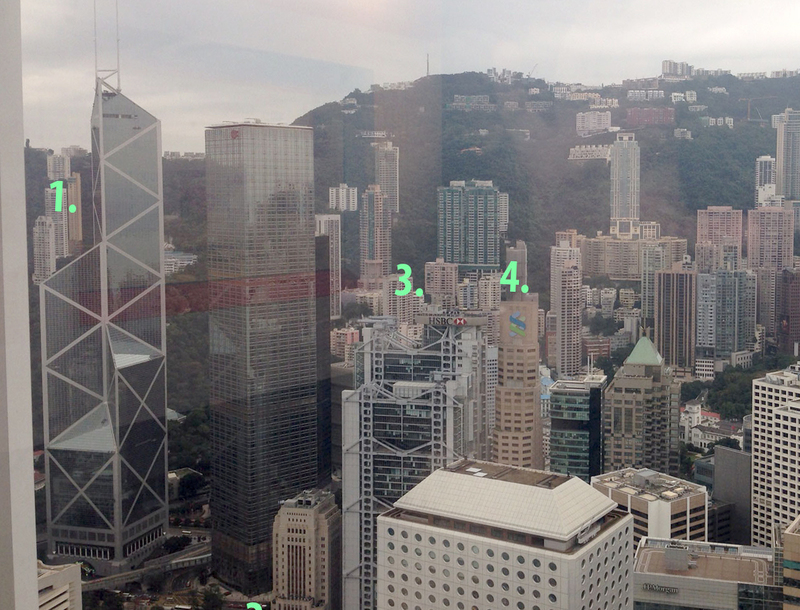 All three are located near each other in Central on Hong Kong Island. We will start our visit with the HSBC building, built in 1985. It was designed by architect Norman Robert Foster at the same location as the previous HSBC building, which had opened in 1935. Of particular interest to us is the atrium, where various informative signs detail the history of the bank and its banknotes. Also, be sure to check the two lion statues out front, which can be found in various forms on most of the banknotes issued by HSBC after World War II. These two HSBC lion statues, named Stephen and Stitt (after two former bank employees), were cast in 1935 after similar lions that could be found at the HSBC Shanghai office. One of the lions, Stephen, still displays shrapnel damage from the Japanese attack during the Battle of Hong Kong in World War II. The HSBC lions, Stephen (left) and Stitt. Right next to the HSBC building is the old Bank of China building. Erected in the early 1950s, it was at the time one of the tallest buildings in Hong Kong, and it was specifically built to be taller than the HSBC building at the time. In the late 1990s the inside of the building was renovated, and the first floor is a beautiful example of mid-20th-century architecture. As it now stands in the shadow of many tall buildings, it is hard to imagine that this at one time was one of the tallest in Hong Kong. From the old Bank of China building we move on to the iconic Bank of China Tower. This building was designed by Chinese architect I.M. Pei and opened in 1990. At nights the reflective silver glass walls are used to host an artificial-light show, and the building is one of the instantly recognizable features of Hong Kong’s skyline. 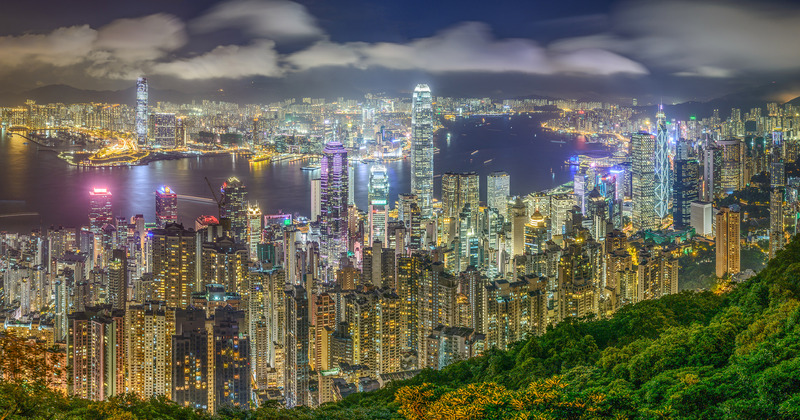 View of Hong Kong Island at night; the Bank of China Tower is clearly visible and displays a light show every night. The final bank structure to look at is the Standard Chartered Bank building, which opened in 1990. It is located on the same site as the old Chartered Bank building, which had opened in 1950. The present building, which rises 42 floors and is 185 feet in height, is one of the more modest-looking buildings on Hong Kong Island, and with most consisting of commercial real estate, we quickly move on. There is one more stop to make on this part of the island: the Hong Kong Monetary Authority Information Centre. Located on the 55th floor of Two International Finance Centre, ot consists of a small museum with examples of circulating coins and banknotes and various electronic displays as well as a research library. Access is free (just check in on the ground floor), and even if the museum is not that impressive, the views from that high up in the middle of Hong Kong’s financial district are certainly worth it. There’s one more numismatic stop to make, but for that we have to make our way from Hong Kong Island to Tsim Sha Tsui and the mainland. 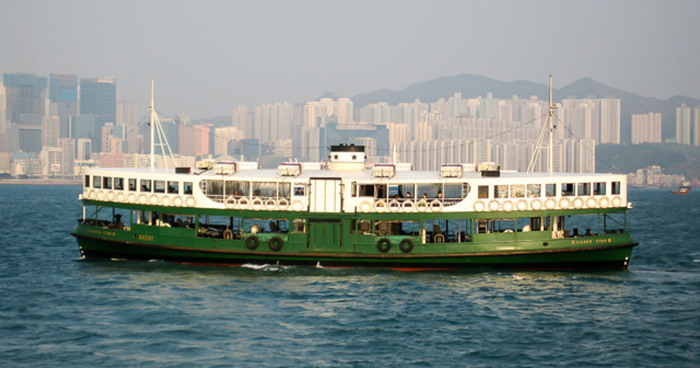 While the subway makes the trip quickly, the best way to travel is on what I call Hong Kong’s best bargain, the Star Ferry. Making the short trip in a few minutes using boats dating back to the 1950s, it is basically the same way people have crossed this way for thousands of years. 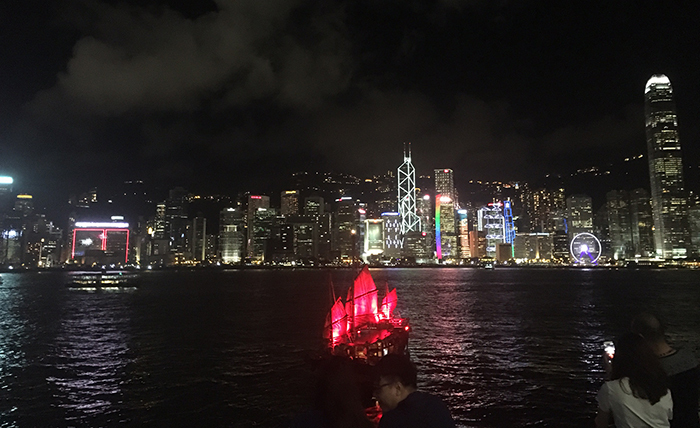 With a fare of HKD 3.40 (about 40 U.S. cents), it is not only cheap, it also treats you to spectacular views, no matter the time of day. After we get off the boat we make our way to the Hong Kong Museum of History, where the region’s history from prehistoric times to the present is covered in various exhibitions. A small selection of coins and banknotes is on view, including some early banknotes that very rarely are offered for sale and that form an important part of Hong Kong history. Also make sure to visit several of the rebuild shops and offices, including the lobby of one of the early banks, giving a good impression of Hong Kong in the 19th century. A really enjoyable and informative article, contemporary field numismatics at its best – thanks for taking the time to share your Hong Kong experience – now on my list of must sees! Smaller coins were last made in 1998 along with a set in 1997 for handover. 10 and 20 cents are not made and are hardly found in use. 50 cents, 1, 2 & 5 Dollars have since been made in 2013 too. 10 Dollar was one time Bimetallic issue in 1994-1996 and has been not minted. 10 Dollar remains a Govt. issue note and you will rarely find 10 Dollar in day to day transactions.